Even as more machines transition to the new USB-C there will still be a need for hubs and adapters for users wanting to use their old peripherals. Now that Apple has done away with all legacy ports and have transitioned to USB-C, there is a need for adapters. SCOSCHE has just announced their USB-C digital AV multiport adapter for all USB-C devices. This multiport adapter supports HDMI, USB Type-A and USB-C port with this particular adapter. Even as more machines transition to the new USB-C there will still be a need for hubs and adapters for users wanting to use their old peripherals. USB-C peripherals should start gaining traction over the coming years, until then, you have options like SCOSCHE’s offering here. OXNARD, Calif. – (Jan. 31, 2017) – SCOSCHE Industries, innovators of award-winning consumer technology and car audio products and accessories, announces the availability of its new, versatile USB-C Hub: the USB-C Digital AV Multiport Adapter (part number: CMPA). SCOSCHE’s USB-C Hub features three ports, which each provide essential functions for new Type-C devices. 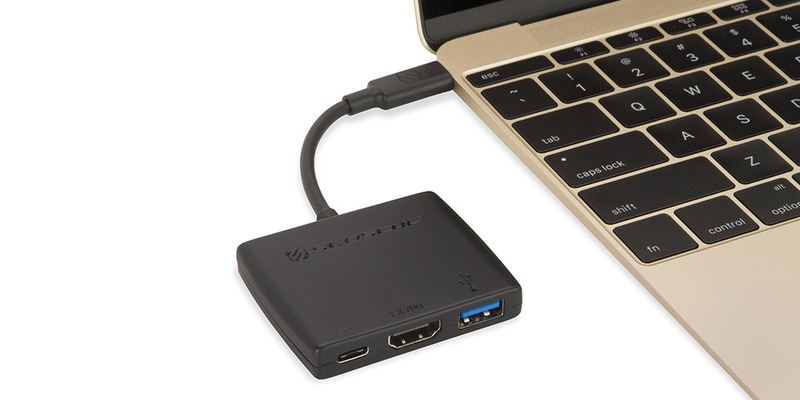 One port is an HDMI connection that allows users to mirror the MacBook display to an HDMI-enabled TV or display up to 4K HD. Additionally, it outputs video content such as movies and captured video. Simply connect the adapter to the Type-C port of the MacBook or other USB-C device and then to a TV or projector via an HDMI cable. The USB-C Hub also has a Type-A port, allowing users to connect older peripherals and computer accessories, such as flash drives and cameras, to the new Type-C MacBook. The Type-A port on the adapter also lets users charge and sync their iPhone, iPad or iPod. For added convenience, the third USB port on the adapter (USB-C) permits pass-through charging of MacBooks or other Type-C computers even when the other ports are in use. With the USB-C Hub – USB-C Digital AV Multiport Adapter, you get fast data transfer speeds with support for USB-C (Type-C) power input. The USB-C Hub is available now for $59.99USD MSRP at SCOSCHE.com and select retailers nationwide and comes with a 3-year warranty.